CallHippo is a virtual phone solution designed specifically for small business and enterprises enabling them to connect with their customers and vice versa efficiently and effectively while keeping expenses low. The software is an ideal platform for small and expanding businesses looking to set up sales and support phone numbers so that they can service their clients better, seize on more business opportunities, and generate more sales. CallHippo is the perfect partner for small enterprises with a fast growing customer base. The software comes with a plethora of features that allows them to connect and communicate with their clients using local phone numbers. CallHippo allows companies to buy local numbers in more than 50 countries and designate certain numbers to certain departments in a few clicks. On top of customer communication, CallHippo can be used to further enhance team communication and collaboration. CallHippo gives small and expanding enterprises with a better way to set up virtual phone numbers for their businesses. 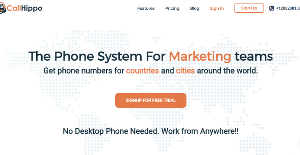 The software allows companies to purchase local phone numbers in more than 50 countries, which they then assign for their sales, marketing, and support teams and other departments in just a few seconds. With CallHippo, you don’t need to have a desktop phone for your teams to fully utilize the software. You can make and receive calls all over the world from your web browser. Aside from engaging your customers and prospective clients via a virtual phone system, you, your team members, and top management personnel can also communicate with each other. This allows for smooth and friction-free discussion of ideas, debates, and collaboration. As all calls and related information such as contact details, call history, records, and more are centralized, CallHippo becomes an ideal call management hub for all team members. The software comes with useful features such as call recording, call forwarding, call analytics, voice mails, and more. You can monitor the quality of your team’s performance and assess individual indicators like the numbers of missed calls, answered calls, and duration of calls. CallHippo lets you play your voicemails in your inbox. If you ever decide to switch to another phone provider, CallHippo lets you retain your phone number for your convenience. There are popular and widely used systems in each software group. But are they automatically the best fit for your enterprise’s specific wants? A popular software application may have thousands of users, but does it present what you need? For this reason, do not blindly spend on popular systems. Read at least a few CallHippo reviews and think about the factors that you want in the software such as the price, main functionality, available integrations etc. Then, shortlist a few solutions that fit your needs. Check out the free trials of these products, read online reviews, get clarifications from the maker, and do your research meticulously. This exhaustive homework is certain to aid you choose the best software solution for your organization’s specific needs. How Much Does CallHippo Cost? We realize that when you make a decision to buy VoIP Software it’s important not only to see how experts evaluate it in their reviews, but also to find out if the real people and companies that buy it are actually satisfied with the product. That’s why we’ve created our behavior-based Customer Satisfaction Algorithm™ that gathers customer reviews, comments and CallHippo reviews across a wide range of social media sites. The data is then presented in an easy to digest form showing how many people had positive and negative experience with CallHippo. With that information at hand you should be equipped to make an informed buying decision that you won’t regret. What are CallHippo pricing details? What integrations are available for CallHippo? Pros: One of the great features of CallHippo is that, you can add multiple features under one number. So, when the customer calls on that number all members under that number will be notified at the same time. Now, if any of the member picks up the call, the remaining members will automatically stop getting incoming call notification. This feature has been a great help for my organization as we have many responsible person for one subject. We would say a big yes to CallHippo! Cons: They need to upgrade the Android app and provide features like IVR and Call extensions. Pros: Thanks to CallHippo, I have levelled up my business and upgraded its communication structure. Working with international clients is lot more convenient. I can track my conversations and keep real-time recordings, which avoids any kind of confusion. Its call analytics tells me about my performance and I think of ways to optimize communication. The best thing about the software is its ease of use. Besides these, it’s extremely flexible and highly customizable. Cons: Can add more features like IVRS, call cascading, concurrent calls etc.